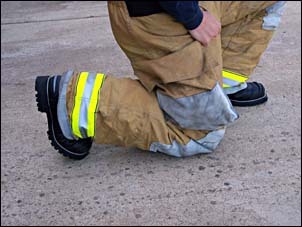 I have been using the PRO-Warrington 5007B Structural Firefighting Boots. My very first reaction upon donning the boots was the ease of getting into them. 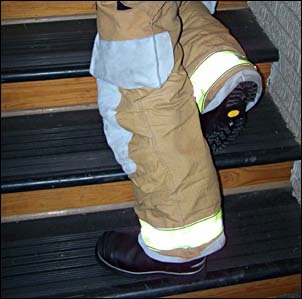 The back and side support features of the boots kept the opening wide open for quick donning. Once the boots were on, I was impressed with the comfortable soles and snug feel around my feet. This prevented any extra unwanted movement within the boots that normally cause blisters. The boots were lightweight, but still seemed very durable and provided adequate support. 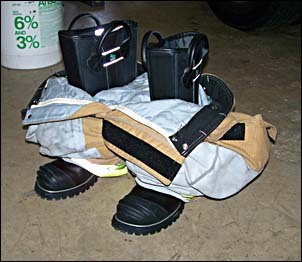 While "duck walking", crawling, and climbing stairs, the no angle shaft of the boot prevented any ride up of my bunker pants completely. My current structural boots have a rounded steel toe, unlike the "oblique" steel toes of the 5007B. I found that I was able to get better grip while crawling and climbing with the oblique toes. Throughout my evolutions, I noticed that my feet never got hot or sweaty, which I will accredit to the good breathability of the boots. Through the crawling and walking exercises the shin guard was not noticed, but became appreciated when low crawling/climbing stairs. 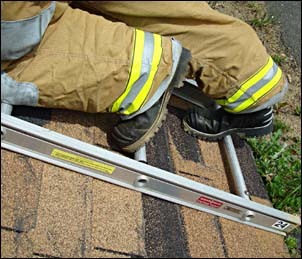 I did, however, find comfort was dependent on the angle on which my shin rested on them. All in all I was very pleased with them and would recommend them to anyone who is ready to get a new pair of boots. To check out the 5007B Pro Warrington Boots on our website, click here! If you have ever toyed with the idea of starting a journal, or you are considering doing so now, take a chance and go for it! There is no right way or wrong way to write. Your benefits will far outweigh your efforts. Who knows what wonderful adventures your journals may one day inspire! I find this website for Extra Wide Steel Toe Work Boots for Men.